Nose: Roasting meats, with a whiff of earthy, mushroomy peat. Grassy, herbal. Nutty and a little salty. A splash of water brings out the nuttiness – some walnuts and almonds. Palate: Full bodied. Creamy. The 100 proof burn is present and intense, but gives way to roasted peanuts, rotisseried meat, salt and light oak. Not at all sweet. Challenging. A splash of water thins the body a little and kills the creaminess. Finish: Medium-long and complex, with dark chocolate, some bitter barrel char, almond extract, and fading vanilla. A little water intensifies the almond, and brings out a surprising little echo of sour cherry and hibiscus. Overall: Springbank 100 is challenging and intriguing. I get new flavors every time I drink it. Try it once with water – the interesting flavors on the finish are nice, but in my opinion the loss of the creaminess in the body isn’t worth it. 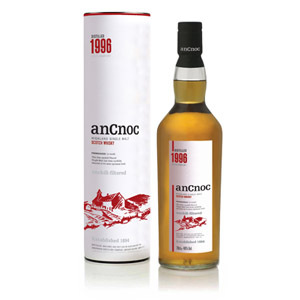 I marked this as “Must Try”, but of course it’s interchangeable with the 46% ABV version – no real need to try both. 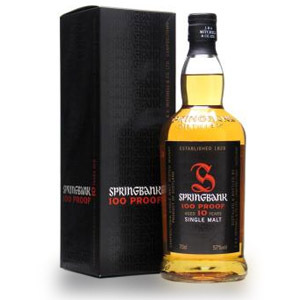 Springbank is a composite of rarities. It is one of the very few distilleries that performs the entire distillation process from malting on-site (its own floor maltings) to bottling in its private bottling plant. 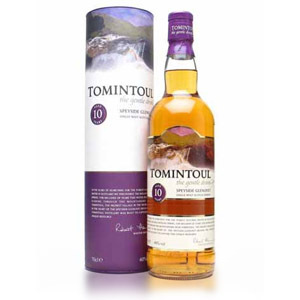 In fact, it is the only fully self-sufficient distillery in Scotland. 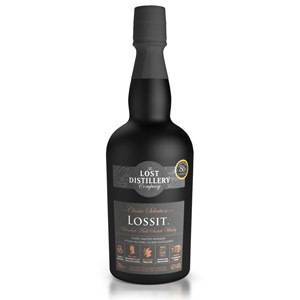 Located in Campbeltown on the lyrical Mull of Kintyre, it is also one of the few surviving distilleries (of three, with Glen Scotia and Glengyle) from a once-great region of Scotch distillation. In 1887 there were 21 distilleries in Campbeltown, and it was sometimes called “The Whisky City.” Hard times and a self-perpetrated degradation in quality (and thence, reputation) during the American period of Prohibition scoured the region, putting most distillers out of business. Springbank claims that hand-turned floor maltings (as opposed to pneumatic or machine-aerated commercial maltings), while labor-intensive, yield a malt that is better because it germinates more slowly. The distillery uses traditional worm tubs, a cast-iron mash tun, and employs mechanical ‘rummagers’ (to prevent a buildup of burnt deposits) in the copper stills, which are heated with a combination of steam and direct oil fire. Springbank uses three stills to create a 2.8-time (not triple) distillation. Now hold on, because this math is tricky: The first “wash” distillation produces so-called “low wines”, which are around 20% alcohol. A second distillation produces an intermediate distillate, which is in the neighborhood of 35% alcohol. A third still is charged with a solution of 80% of this double-distillate and 20% of the “low wines,” and a third distillation is performed. Thus, in the final spirit, around 80% of the volume has been triple-distilled, while around 20% of the volume has been double-distilled. Hence, 2.8x distillation. Phew! For a fantastic and in-depth guided tour of Springbank distillery, be sure to check out Ralfy’s visit (scroll down). Springbank also makes Longrow (a peated malt) and (new in 2006) Hazelburn (unpeated, truly triple-distilled). These, along with the distillery’s flagship Springbank bottlings, are all non-chill-filtered, have no caramel coloring, and are reduced to bottling strength on-site with the same water used to produce the whisky. The water, like all Campbeltown whiskies, comes from the Crosshill Loch in the hills above the town, and is supplemented by a private well from a borehole drilled deep into the rock beneath the town. 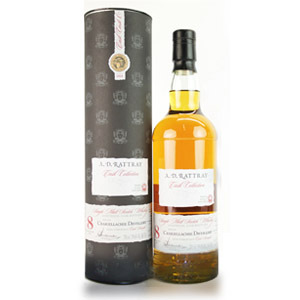 Note that the Springbank “CV” bottling, which is at a similar price-point, is purportedly a vatting of 6, 8, and 12 year-old malts (unverified), from different barrel finishes. Glad to see you liked the Springbank. 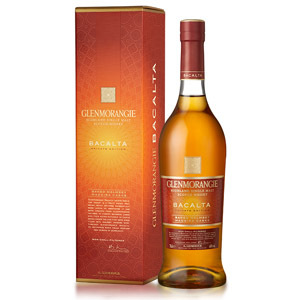 It’s really one of my favorite bottles out there, and if I see the 10yo on anybody’s list I generally will go for it. At some point, avail yourself of a pour the 15. I really think there’s a lot to like about it. Will do, thanks. I’ll have to wait until I can find it on a bar menu though. So many whiskies to try, so little time! I’m not 100% sure but Springbank 100 proof might be discontinued. Instead I’ve been seeing a 12 year old cask strength bottling at specialty stores.